The Town that Dreaded Sundown is one of those titles that just sticks in the brain, even if you know nothing else about the movie. That is pretty much my entrance into this relatively obscure film. It is a movie I had often heard mention of by those in the know, but it was never anything more than a passing reference. Of course, the title is probably at an all time high now, with the impending remake and the recent Blu-ray release (it's first since a VHS release back in the day). It is a movie that has a title that inspires dread and an iconic image of it's antagonist, a hulking man wearing a burlap sack for a mask. That poster is an image sure to remind folks of Jason Voorhees from Friday the 13th Part 2. There is know doubt that this movie had to have had some inspiration on the producers of the slasher series. Of course, that begs the obvious question of who wore it better? Well, maybe not, but both of these killers strike an imposing visage on the screen. I can tell you, I would not want to be confronted by a maniac in a burlap mask! The movie was directed by Charles B. Pierce, who also helmed The Legend of Boggy Creek and The Evictors. Pierce spent most of his career as set decorator on, working on titles like Foxy Brown, Black Belt Jones, and Coffy, but he held his own as a director, bringing a sense of realism to his efforts. The screenplay was handled by Earl E. Smith, who also has story credit on the Dirty Harry movie Sudden Impact. The most interesting aspect of this story's genesis is that it is based on actual events, albeit loosely. There were a series of murders in Texarkana in 1946, where witnesses describe the killer as wearing a sack mask. The killer was never caught and the murders have been left unsolved to this day. Honestly, knowing this gives the movie a chilling atmosphere. As The Town that Dreaded Sundown begins, we are introduced to Texarkana in 1946, we learn of soldiers returning from war, a growing economy, and life beginning to return to normal. Then we have the first attack, a couple on lover's lane have their moment interrupted by the villain in the sack mask. Three weeks later another couple is attacked and killed. Now, the town is starting to get scared. The police have no leads, and everyone is left baffled. As the movie progresses, we are told through narration updates on the police ramping up the investigation, curfews, people scared to be outside at night, and other details. It gives the movie an odd feel, part exploitation terrorizer and part documentary recreation. This results in an uneven feel to the movie, at times it is a solid movie with rough edges, other times result in a bore with some oddly placed humor. I like the movie and it is easy to recognize as a minor classic, but I do not love it. It is a movie that is sporadically entertaining. When it hits, it hits, but it is few and far between, basically, whenever the Phantom, as the killer is dubbed, is in action, it works. The attacks are rough, gritty, and have a realism that really hits home. Of these, the attack on the trumpet player is pretty grim and disturbing, and the attack on Dawn Wells' (Mary Ann from Gilligan's Island) is really intense, the bit of him crashing through the screen door is particularly blood chilling. 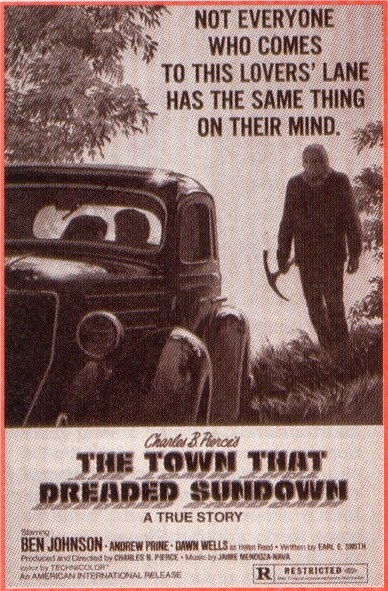 In the end, The Town that Dreaded Sundown is a good movie, but far from great. It is certainly worth the time, again when it works it works. It is not a thrill a minute horror movie, it is closer to a docudrama targeted at the horror crowd. It brings a loosely adapted true story to horror aficionados and looks to inject a “this is what happened” element to it with the voice over elements. Give it a go, it does have some rather memorable moments.